CIRC has been building cars for 20 years, and our products have scored numerous event wins, championships and records. We can construct your car to the most exacting standards and to any level of completion you require, including fully 'turn-key' vehicles ready to take to the track. Turbo Pro Modified chassis to SFI 25.2. To visit the full gallery of this build, just click on either of the photos. Another 25.2 chassis, this time for Steve 'Splinter' Nash's turbo Cougar Street Eliminator car, shown here in fully rolling form. 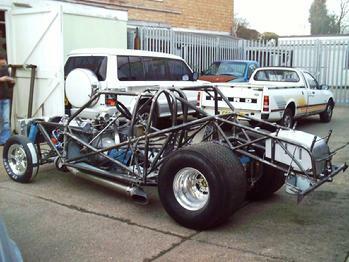 Backbone-style chassis for Paul Holland's roadgoing Mk 1 Zephyr, shown here in bare form and, on the right, with the suspension attached. An extensive gallery of this build can be found on our 'Customer Cars' page. Morris Minor circuit racer. The rules for the class in which this car was originally intended to run prohibited spaceframe chassis, so the whole front end has been rebuilt using sheet steel to form a monocoque-style chassis structure tied into the floorpan and roll cage, in order to accomodate the small-block Chevy motor and CIRC designed and fabricated front suspension.